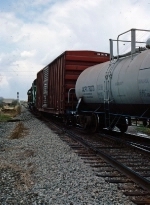 Description: With 2 cars, train 20 departs the yard. 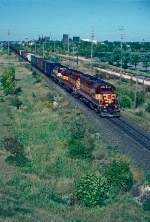 Description: Train 19 climbs the grade behind the downtown. Description: Train 19 heads onto the Division St. trackage after pulling past the downtown. Description: Train 19 rolls along the Division St. trackage. Description: Train 2 rolls down Division St. trackage. Description: Train #20 heads east out of town. Description: Train #20 rolls over the east switch at Oshkosh siding. Description: This is the lead train for the POTUS (George W. Bush) campaign special. Description: Train #19 heads over the interchange built in anticipation of the FRVR merger. Description: Train #19 rolls over the detector at MP 167.8. Description: Train 19 heads up the main at Oshkosh East while #2 waits in the hole. Description: Train 218 rounds the cure off the Shawano Sub. It is about to enter the Neenah Sub and head east to Chicago. Description: Train 7 departs Shops Yard in the last rays of daylight. 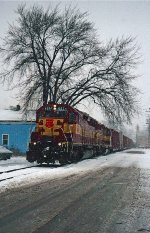 Description: Train 7 heads west on the Neenah Sub. in the last rays of daylight. Description: Power for #7 backing across Lakeshore Dr. at Shops Yard. 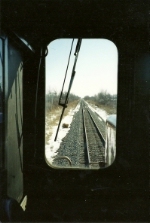 Description: Train 7 crosses over to the Neenah Sub. at Tower CF. Description: Running long hood forward the 6501 leads #7 on the Neenah Sub. Title: GP40 in Your Face!!! 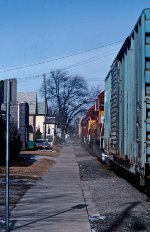 Title: A uniquely Canadian SD40-2W leads a Wisconsin Central GP40 headed passed "William St" and into NS's Bison Yard. Description: WC 3006 with his short local in tow, out laws just miles from it destination point. 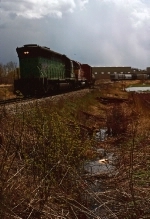 CN Woodcrest Yd. Description: DM&IR SD40-3 411 and WC GP40 3006 sit at Homewood Yard. Description: Unpatched SP SD40M-2 8613, WC GP40 3006, and DM&IR SD40-3 411 sit at Homewood.